The Samsung Galaxy S10 5G is set to release at some point later in 2019, but according to a new leak it could be a lot closer than some might have expected. Yonhap News is claiming the brand has confirmed the handset will be released in South Korea on April 5, to seize on the imminent roll out of 5G in the territory. In the US Verizon is starting its 5G networks in Minneapolis and Chicago on April 11, so the Galaxy S10 5G would be 5G-less for at least a week if the date was accurate and the handset lands over there. What did we think of the Samsung Galaxy S10? 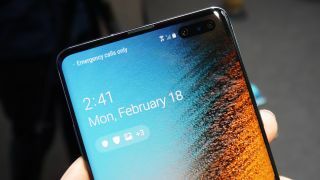 Since 5G networks aren’t widely in place yet and it’ll be months before most cities have them, we’re surprised this date is so early - especially as Samsung hasn’t made a big marketing push for it yet. We do know some information on the Samsung Galaxy S10 5G however – the handset will be exclusive to Verizon in the US, but other countries will see it sold from various retailers, such as O2 in the UK. While Verizon is launching their 5G network in select US cities from April 11, O2 will be launching its in Edinburgh, London, Belfast and Cardiff later in 2019, and will be bringing the Galaxy S10 5G out to be used on them. The Samsung Galaxy S10 5G is, as the name would suggest, a 5G version of the Samsung Galaxy S10, but it has a bigger screen size than any other S10 phones including the Galaxy S10 Plus, a bigger battery, and has an extra 3D depth camera over its smaller siblings. It’ll also likely cost a lot more than the other Galaxy S10 phones, with Yonhap sources suggesting around 20% more than the Galaxy S10 'regular'. We spoke to Samsung to see if the release date was going to be brought globally, and we’re waiting to hear back from the brand shortly. For more information on the Samsung Galaxy S10 5G stay tuned to TechRadar, where we’ll let you know if Samsung confirms the phone’s release. This article was updated to reflect the source of the story, Yonhap News, which quotes Samsung in its reporting of the release date, lending credence to the news. Could the Samsung Galaxy Note 10 have a 5G version too?